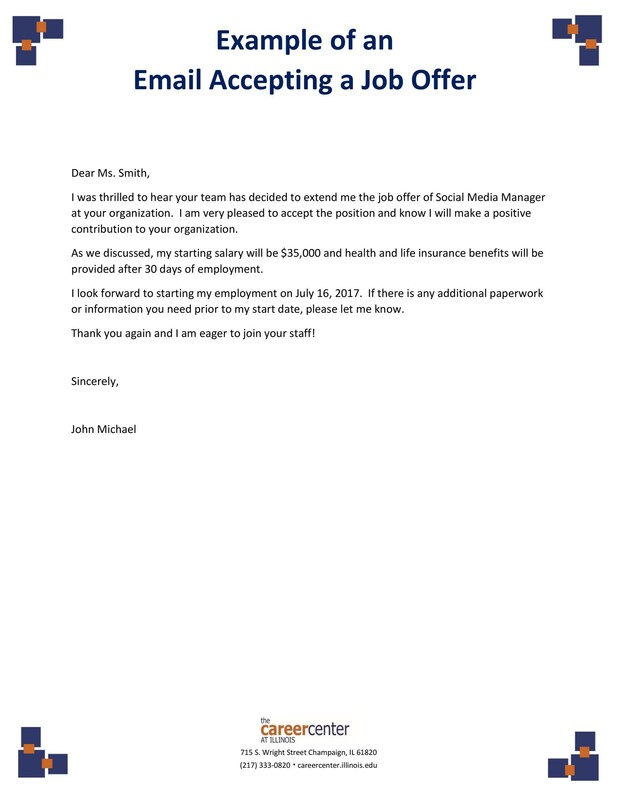 A job offer acceptance letter is something you can provide to a new employer once you have made the decision to take on a job that’s been offered to you. This document is critical as it allows you to reiterate your understanding of some key elements pertaining to the new position. At the same time, it shows you are a consummate professional with exceptional business etiquette. 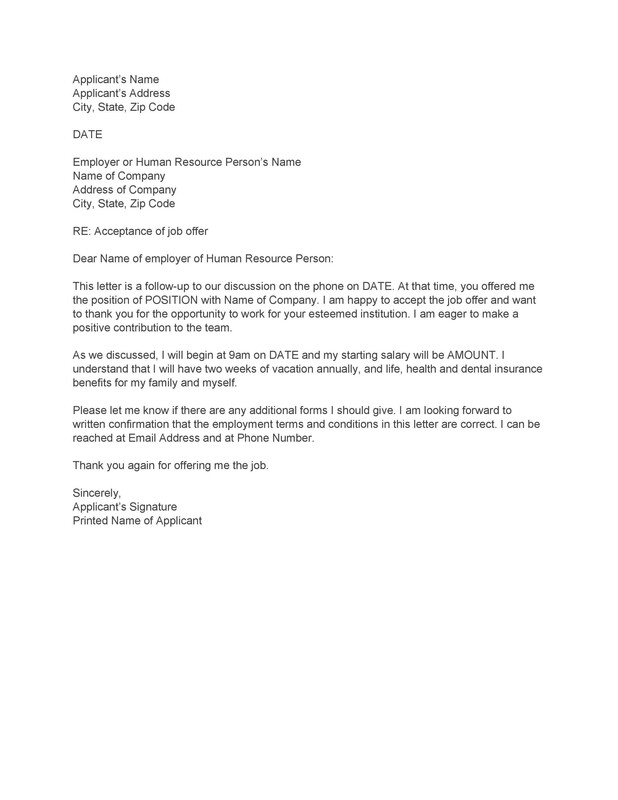 Whether you write out a job acceptance letter on stationery or you write a job acceptance email, there are some key components that must be included within the body of the letter. 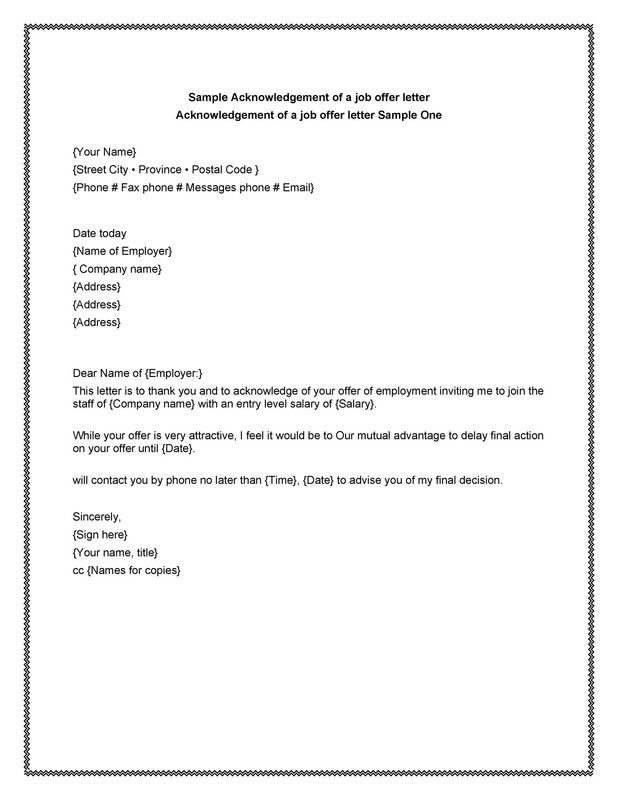 The structure of the job offer acceptance letter is also of importance. 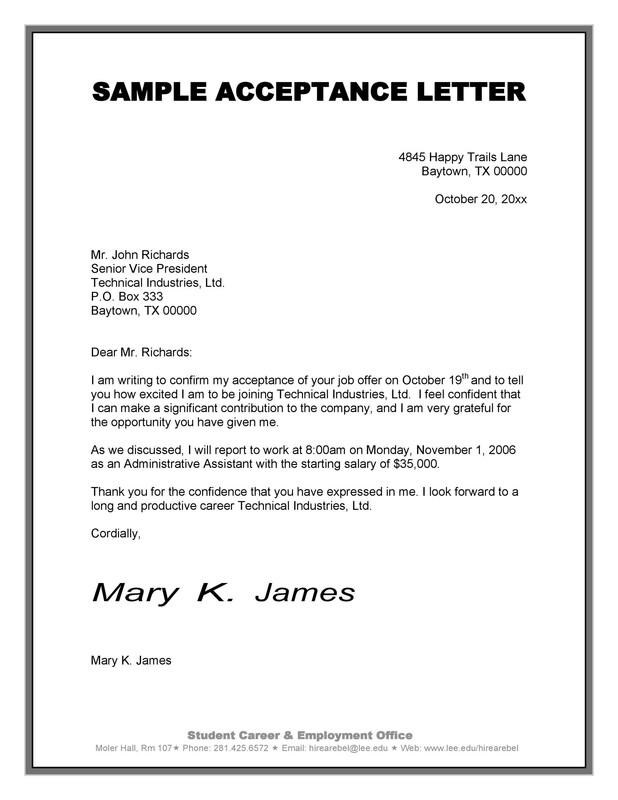 Knowing how to formulate the job offer acceptance email or paper letter is vital. You don’t want to miss out on including any necessary information. You also want to keep the letter as brief as possible. Remember, the person hiring you is apt to be busy conducting business. A tightly written, a terse letter is therefore in order. The acceptance of the job and the expression of your gratitude for the position are the theme of the letter your write. 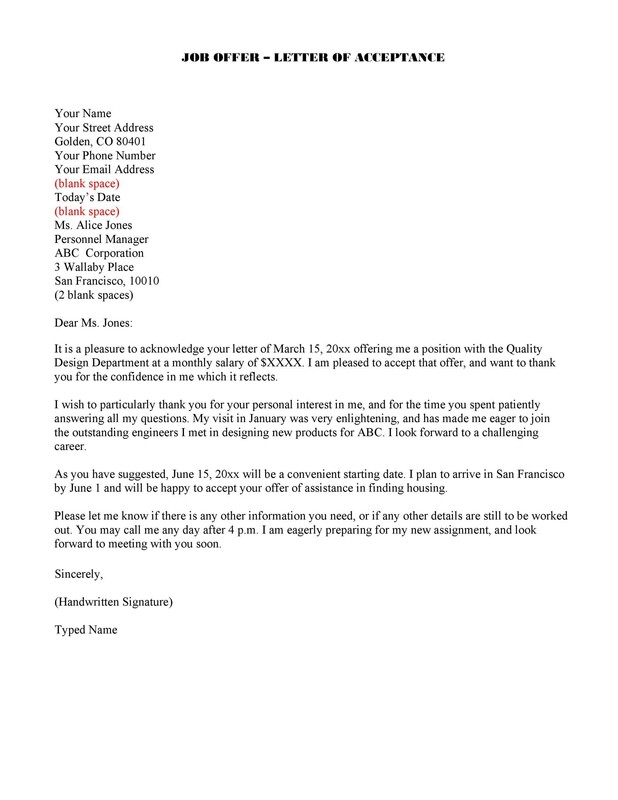 The tone of the job offer acceptance email or letter should remain light but professional. This is not the type of letter where you might include casual jokes or attempt to humor the individual you are writing to at the time. You can be friendly and gracious, but joking around is inappropriate because you don’t know how the person getting the letter will receive your sense of humor. 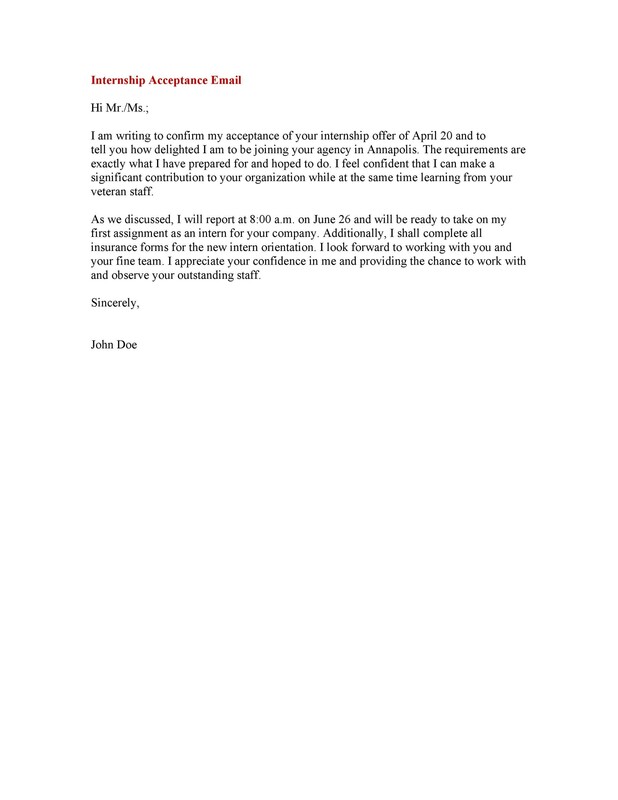 The body of the job acceptance letter should include information that reiterates your understanding of the job title. It should also include your understanding of the basic duties of the job. Doing this will allow you to demonstrate an understanding of the job offer and the expectations that come with it. 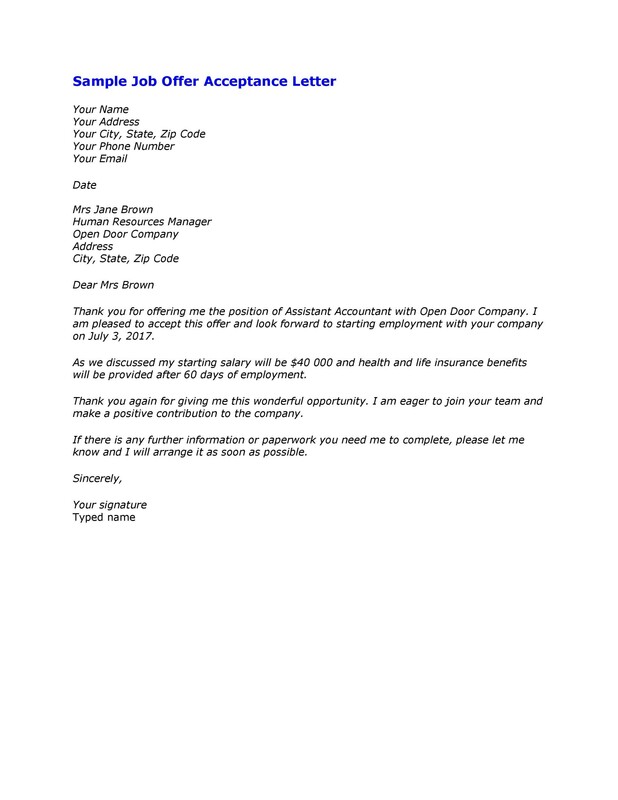 You will want to include a brief note on your expected salary and benefits as well. This makes the document something that can serve as evidence in the event you ever require it. The likelihood is low, but it is best to be prepared in advance. The letter you write should be upbeat. Keeping it short ensures the reader can immerse themselves in the reading of the letter without feeling like it’s a tedious chore. You want the reader to be engaged, not bored. The key is to make an impression on your new employer. When writing the job acceptance email or letter, make sure you think about how the reader will feel when reading what you wrote. 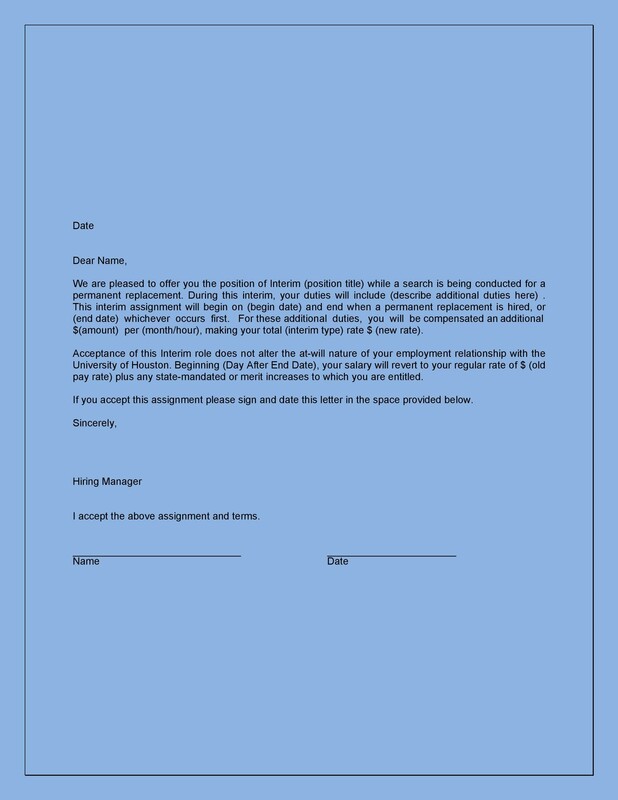 You should remember that this document is supposed to represent you while you are not in the physical presence of the employer. 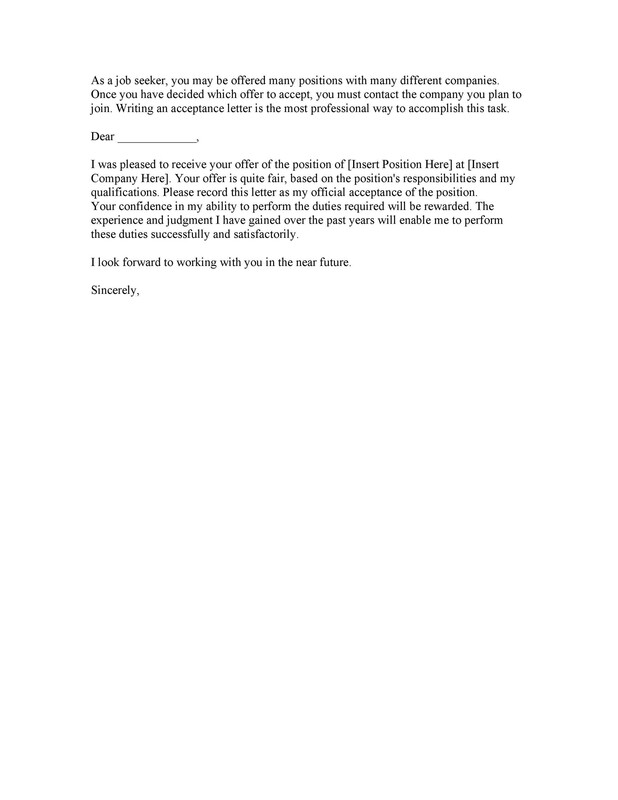 Keeping the job offer acceptance letter cordial and professional will make a lasting impression. 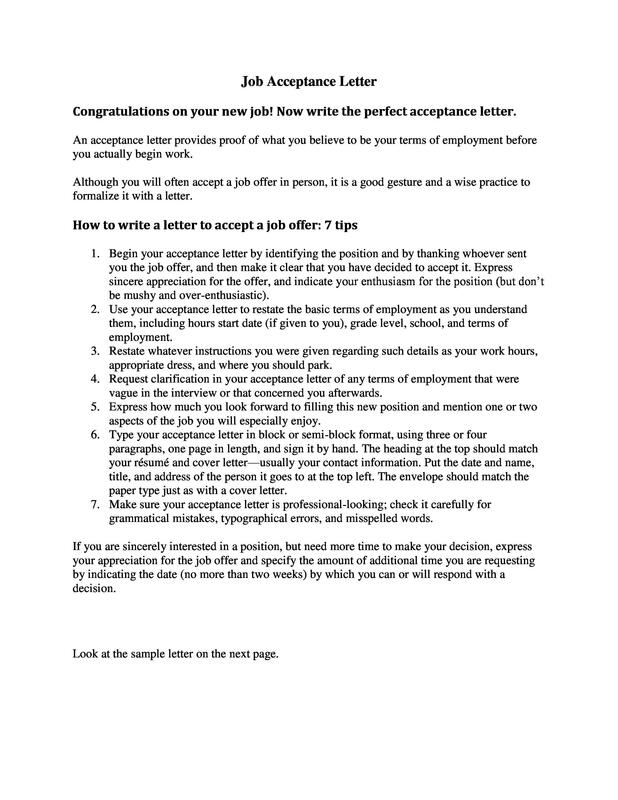 It is a good idea to do a draft of the job acceptance letter first before sending it to the new employer. When you are writing a draft, you can free write and put your ideas down on paper first. This allows you to give full consideration of what you are writing. It also allows you to give careful thought to what you plan to say in the letter. 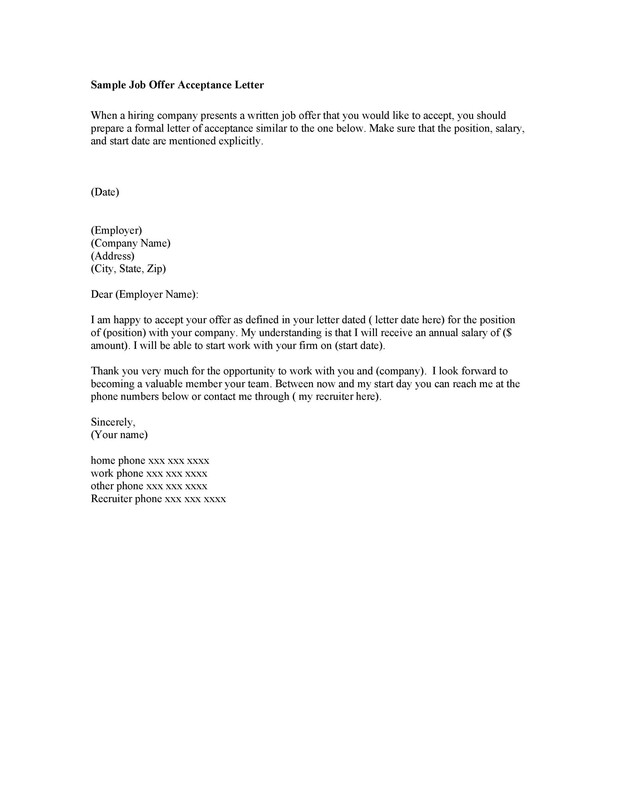 After all, the document is supposed to represent you while you are trying to make a good impression. Since this is a new job, you want a fresh start and a clean slate. This makes your first written contact all that more important. Whether you are writing the letter and sending it by email or traditional mail, you want to use a formalized style of writing. 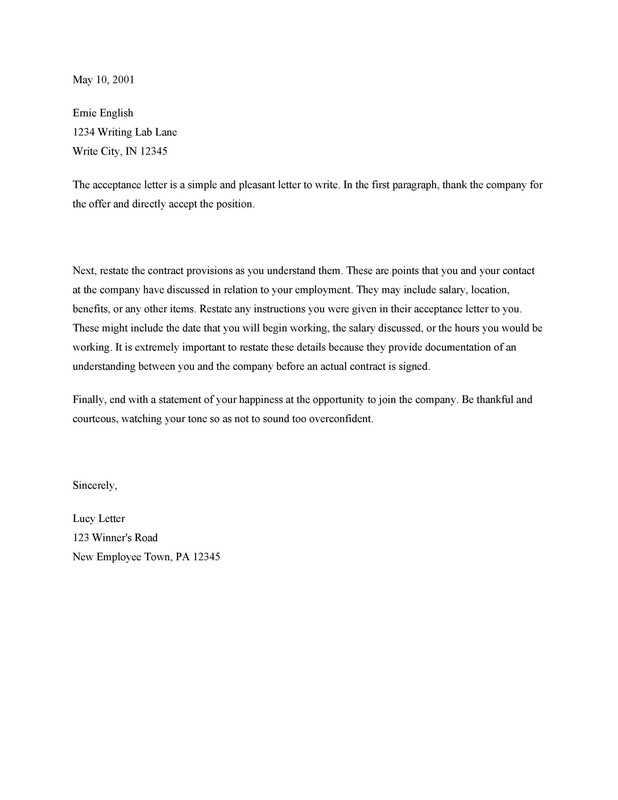 When you are finished, the letter should look like a professional business letter. 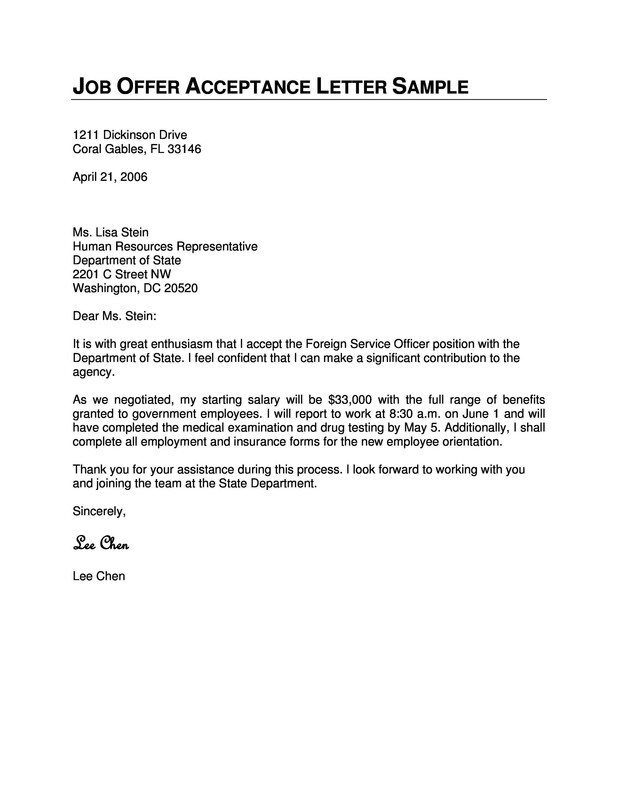 This means the document should contain the necessary addresses, greetings, body, and signature portions you would find in this type of document. 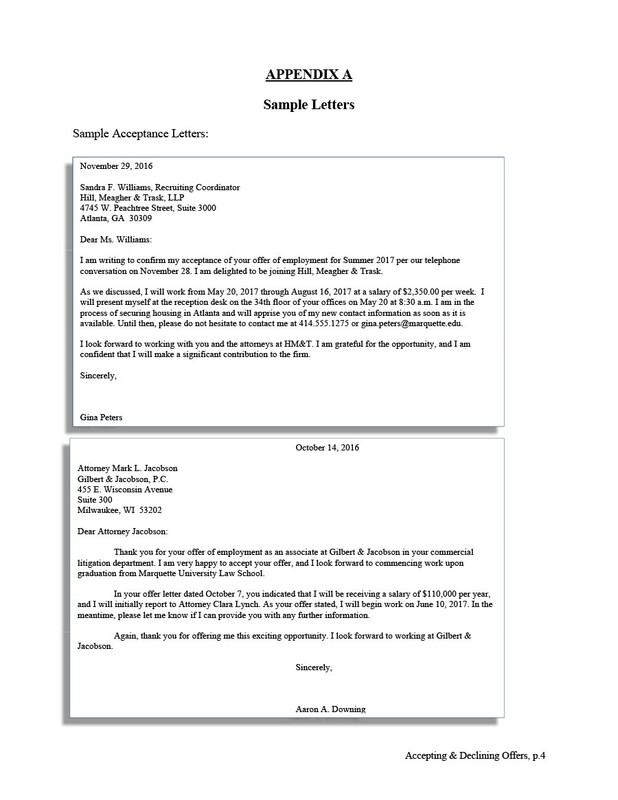 There are three types of business letter format that are appropriate for a job acceptance letter. The most common type of letter is a block style. The other two types of letters are the modified block style and the semi block style. The main difference between these letters is the type of layout you are using. Block style letter: With this type of letter the entire body and all the content of the letter is aligned with the left margin. The right margin remains unjustified. 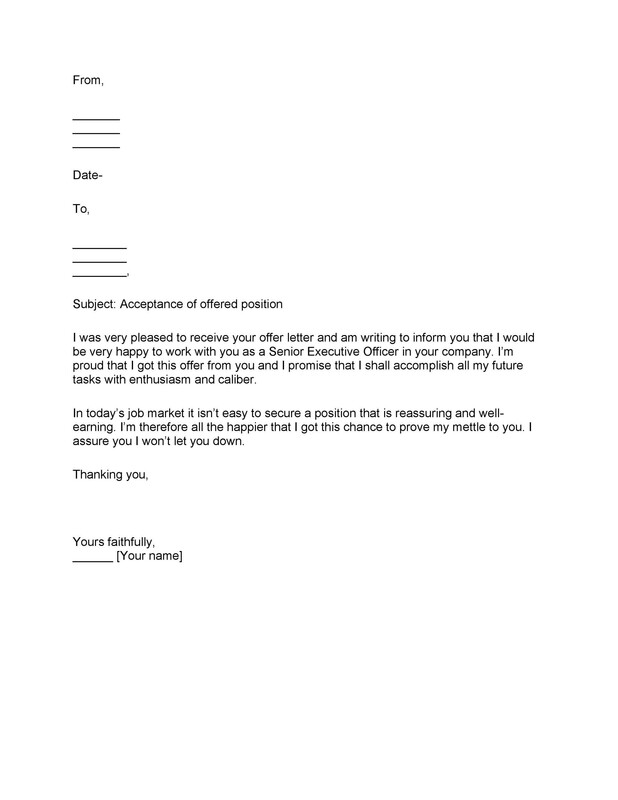 This is the simplest format to use when writing a job acceptance email or letter. 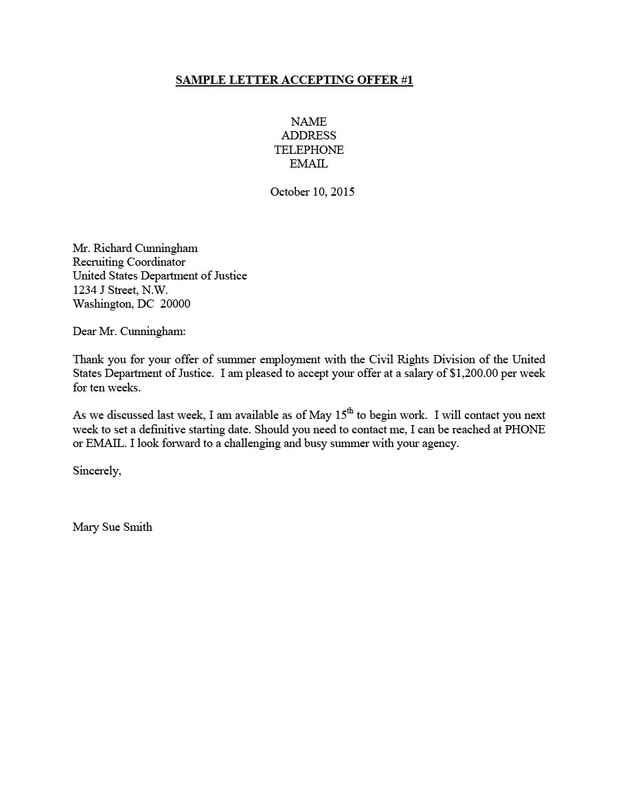 Modified block style letter: With this type of letter, the heading at the top of the letter containing information on how to contact the letter writer, is aligned with the right-hand margin. The signature line is also aligned with right-hand margin. Everything else remains the same as a traditional block style letter. Semi block style letter: This type of letter has the same body as a modified block style letter. The main difference in this letter that each paragraph is indented. 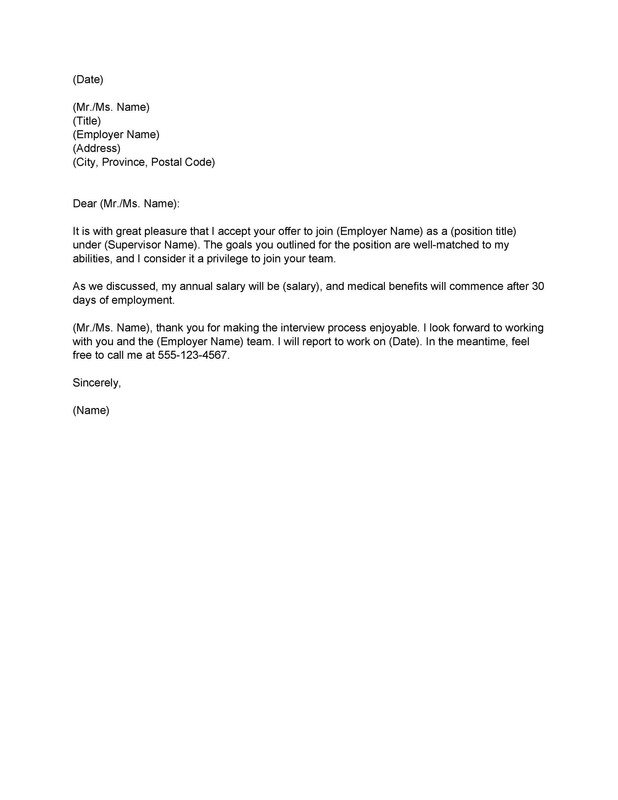 Then, the block style letter is the simplest format to use when creating your acceptance letter. 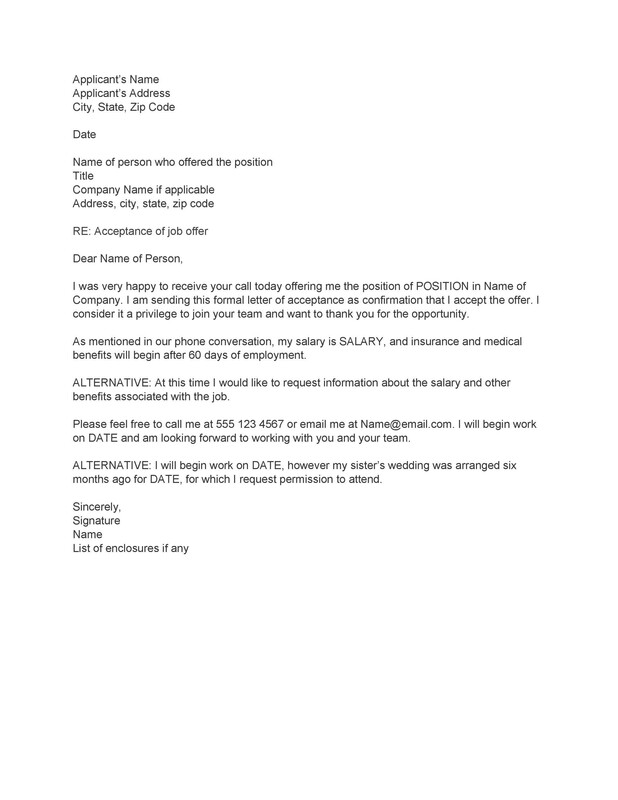 Your contact details: The means for contacting you should appear at the top of the document. This should include your full name, your mailing address, your telephone number, and your email address. You have the option of occluding your fax number as well. 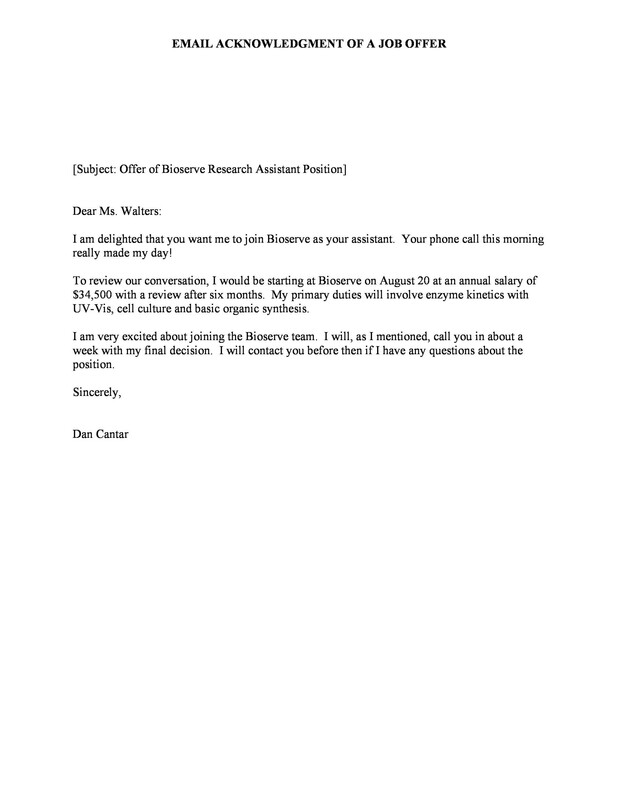 The current date: even though email dates the contact for you, you should still include the date in the body of the email to the letter looks fluid and professional. If you’re sending a paper letter, the date was just below your contact information. The contact details and the current days are part of the letters heading. 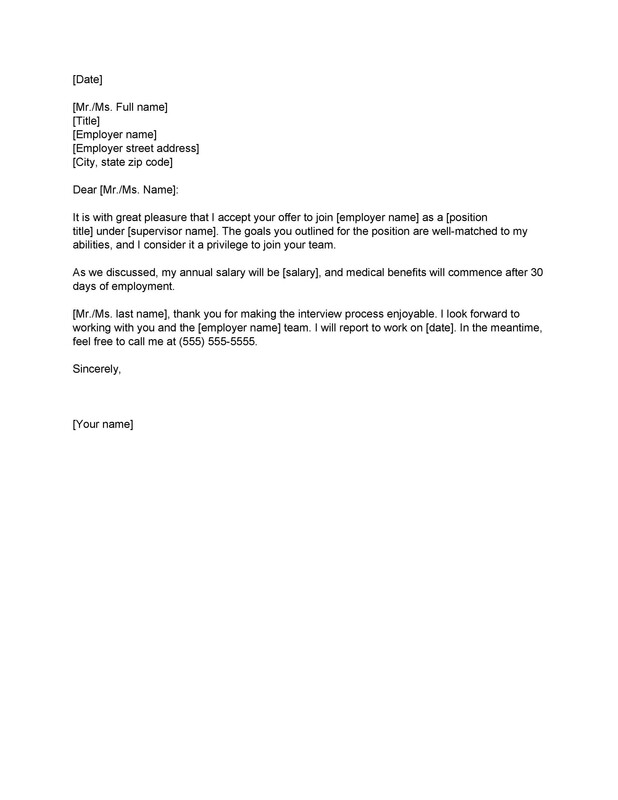 The addressee: Make sure you address the letter to who hired you. 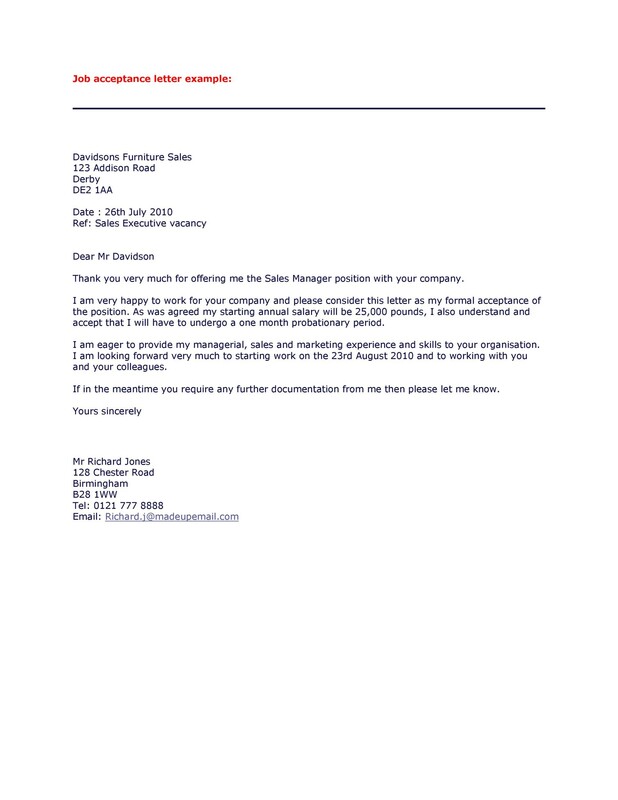 Use the person’s full name and any necessary titles to maintain professionalism. If you know the department that the individual works for, include that underneath the person’s name. The business address: This should be included underneath the addressee’s name and job title. Include the street name, city, state and zip code of the business. This is called the inside address. Greeting: The greeting is sometimes called the salutation. 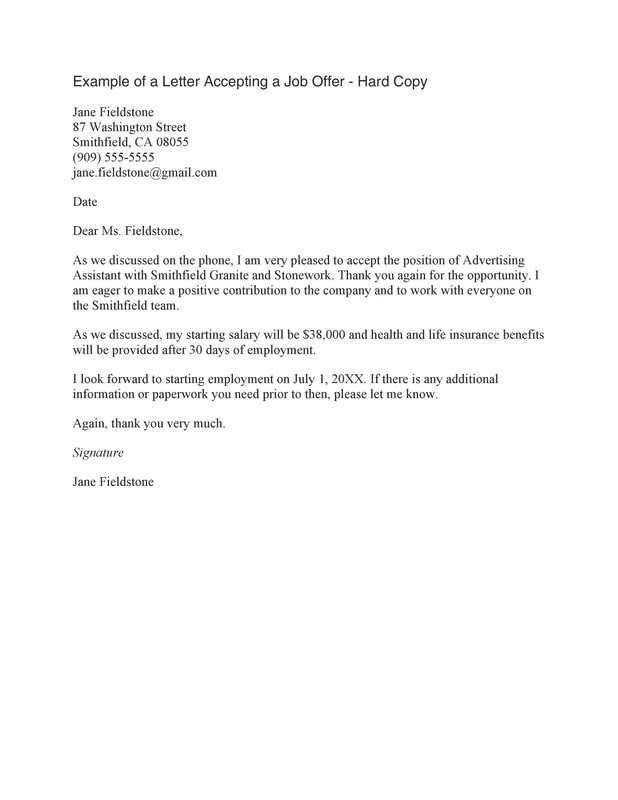 The job acceptance email or letter always starts out with a greeting. You should refrain from using the greeting “to whom it may concern.” The phrase seems distant and sometimes nonchalant. It is far more professional to address the person directly. Therefore, begin the letter with the word “Dear” followed by the name of the person that you are addressing with the content. Again, ensure that you add any necessary titles like “Mr,” Mrs.,” or “Miss.” You can also add suffixes like “Junior,” if applicable. It is important to place a colon after the job acceptance email or letter greeting instead of a comma. 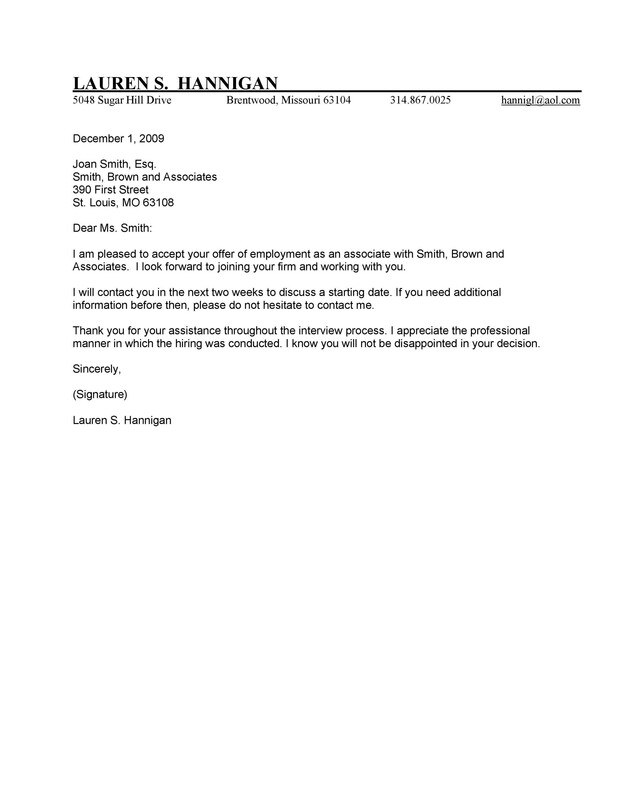 This is a distinction between a business letter and a more personal one. 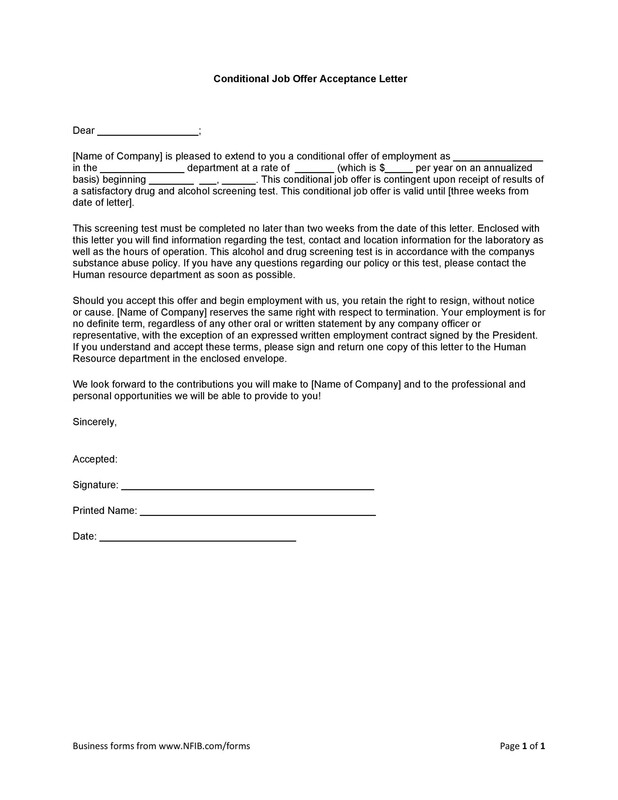 The body of the letter: This is the main content of the document and will cover the important aspects of your acceptance. 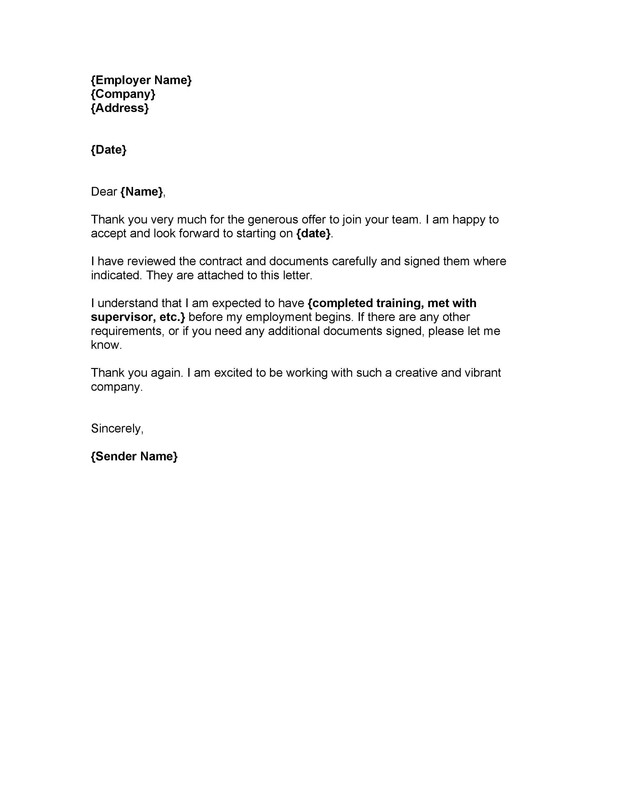 You should begin the letter by immediately thanking the individual who has hired you. As you thank the individual, be sure to express your gratitude for being offered the job position and name of the position by its title. 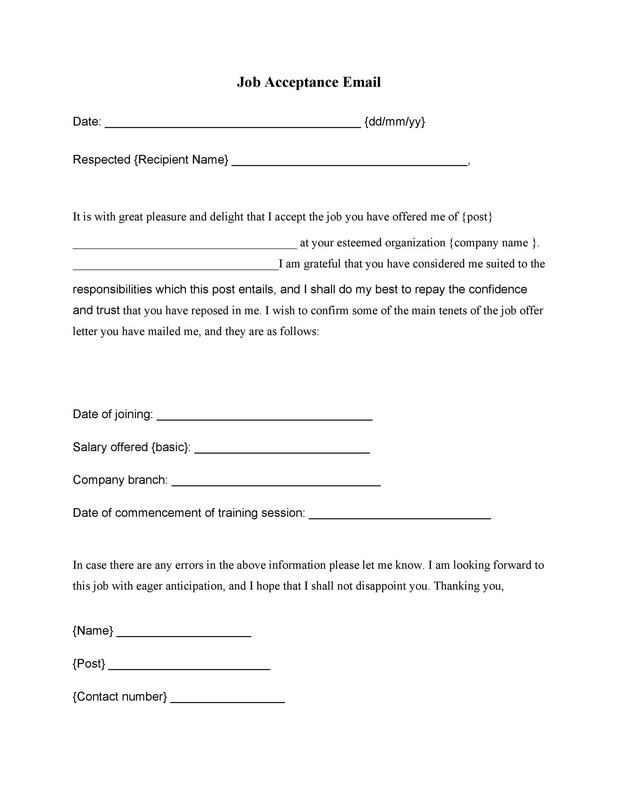 Make it clear that you are happy to accept the job offer and reiterate your employment start date. 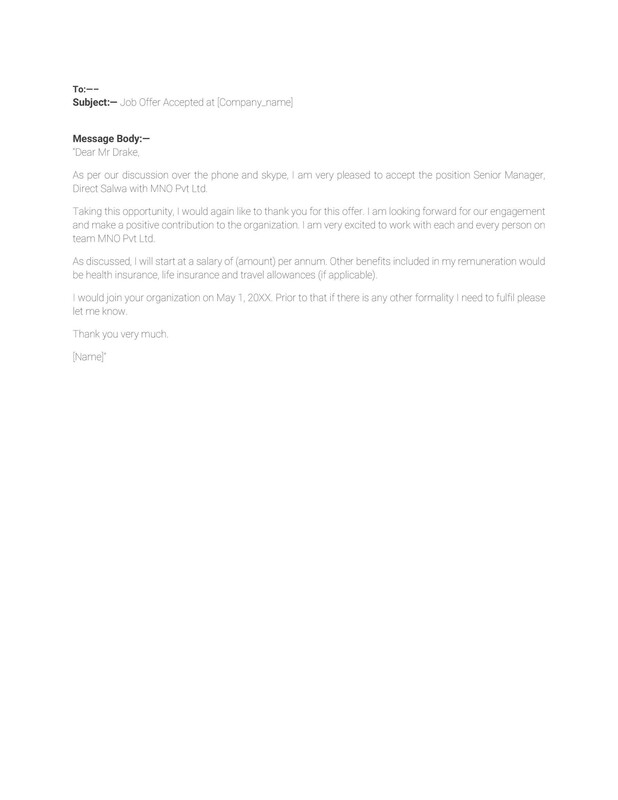 You should include a word or two that you are clear on the exact salary you will be making a specifically mentioned the benefits you will receive. If there is a delay in receive benefits, make sure that you let the employer know that you acknowledge this delay and understand it. 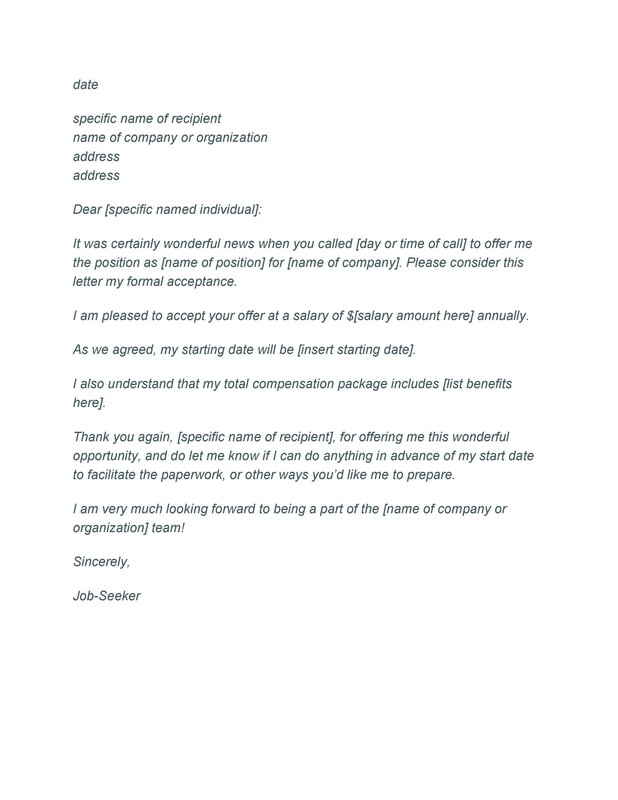 Content wrap up: At the end of the letter, take the opportunity to express your gratitude once more in this job acceptance letter. You might want to mention your eagerness to join the company and to begin the process of becoming an excellent contribution to the business. A few final words on how the person can contact you if they should need anything else from you is also appropriate. 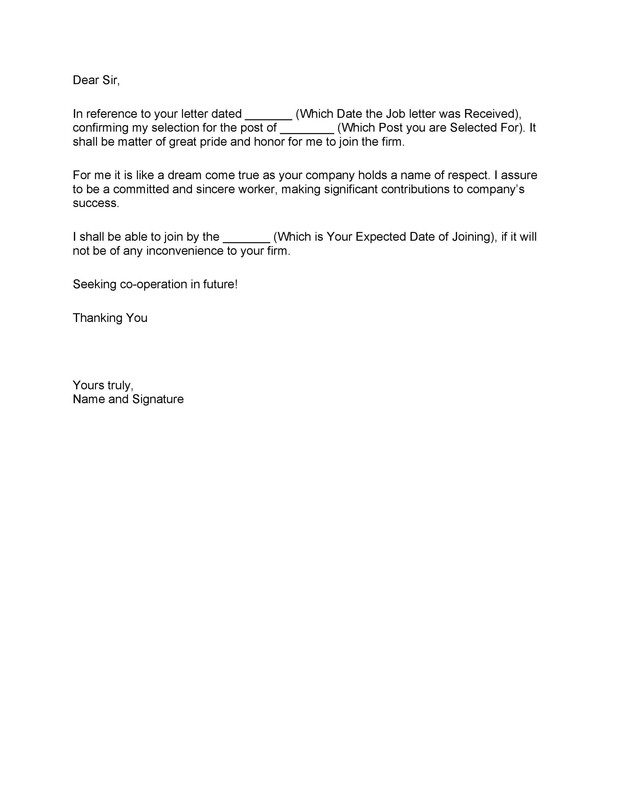 Signature line: your name appears at the end of the letter. If you use your middle initial is also included. This line should appear two lines below the body of the letter. After you draft the letter, it’s time to finalize it. Check everything over and make sure you’ve covered all the topics you need to cover. Be sure to include the key elements mentioned above. Then begin the final proofreading process. Sometimes it is good to walk away from the document and to read it with fresh eyes later. 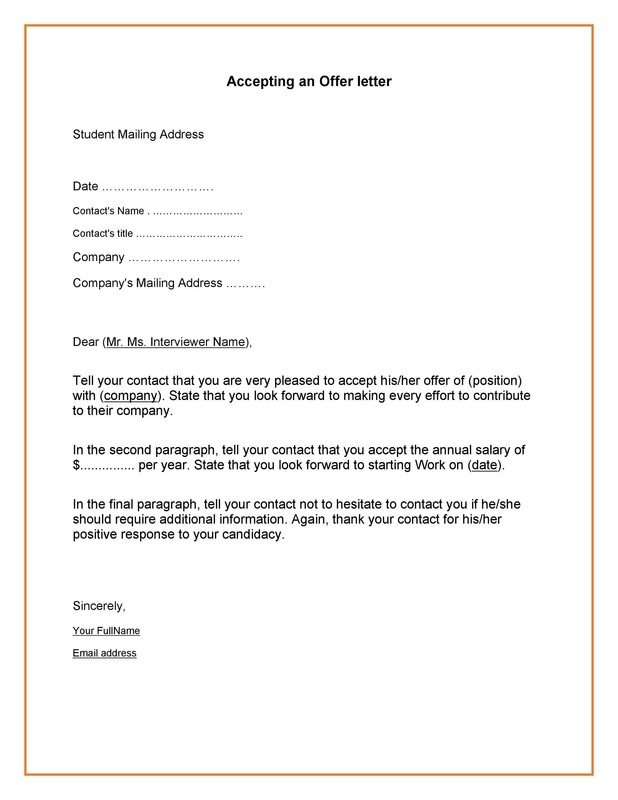 It gives you an opportunity to spot any errors in the job acceptance letter you might miss otherwise. As you review the letter for errors, make sure you check it over for the general tone. 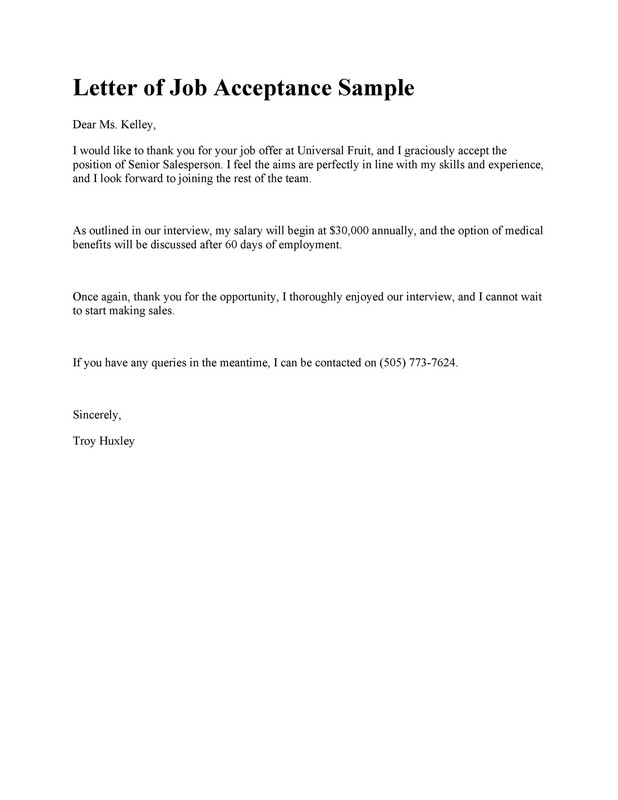 Read the job acceptance letter out loud to yourself. It will help you spot awkward wording or anything that doesn’t read smoothly. Make sure you use the correct punctuation throughout the letter. Also, check that the spacing is correct. Do not include postscripts in the letter. 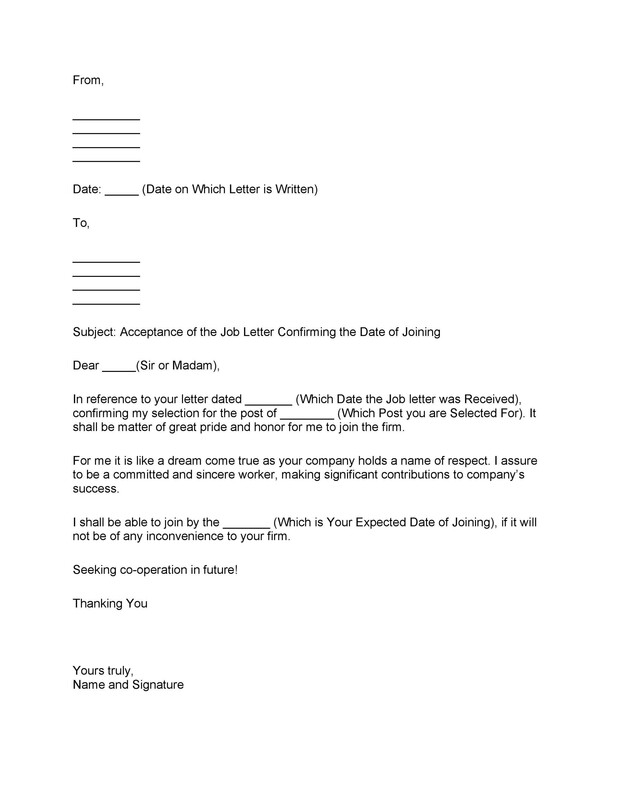 You should cover everything you need to in the body of the job acceptance letter. A postscript is an afterthought. If you include it, it makes it look as if the letter was not planned appropriately. Leave the postscripts for personal writing. 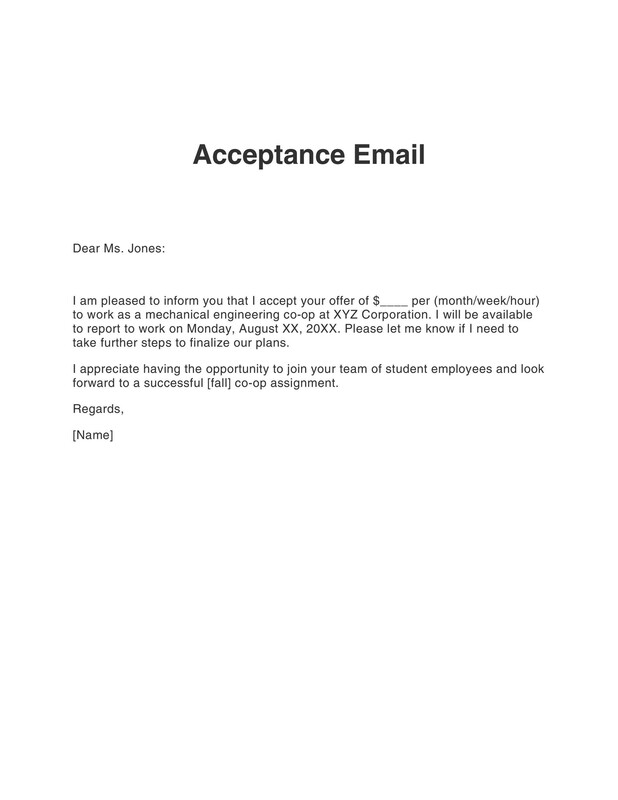 When writing a paper job acceptance letter, you want to choose the best paper possible. It is the same if you are submitting your resume to a business. Of course, the color to choose is white. You don’t want an elaborate stationery that subtracts from the reader’s ability to read the document with ease. Bright white paper is best. 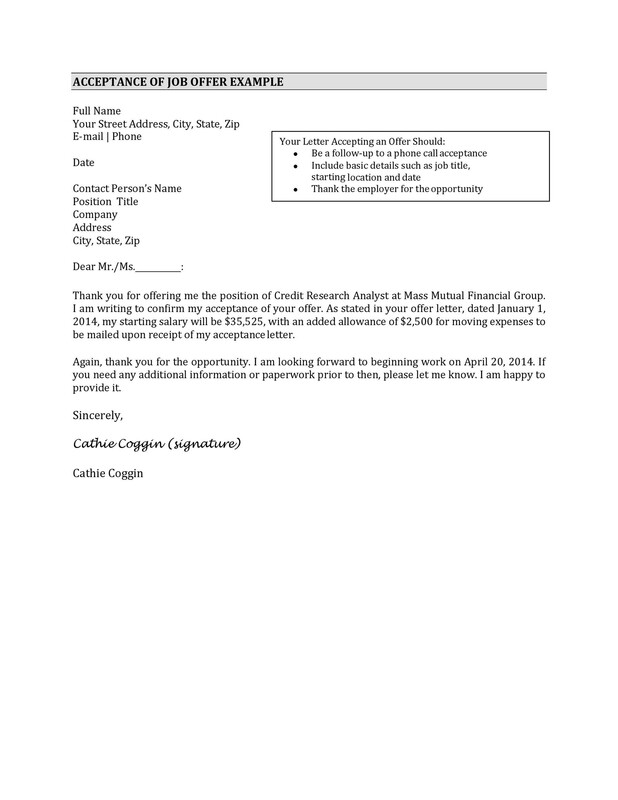 The weight of the paper for the job acceptance letter is also of considerable importance. Different weights will print with different qualities. The paper should be a mid-weight paper. The best weight is 22 to 24 lbs. If you are sending the letter to an eco-friendly business, you might want to use an environmentally friendly paper. There are recycled paper options that print out nicely. There are also different types of paper certified by organizations with the aim of protecting the wildlife and forests. Your typed signature is nice, but an electric signature is even better. You can use an online service to apply an electric signature. Otherwise, you can scrawl out your signature on a piece of paper. Take a photo of it. Crop the image and upload it to your email or paste it into the document you are writing. If you happen to have pending interviews after you have accepted them, make sure you call and cancel the appointments. 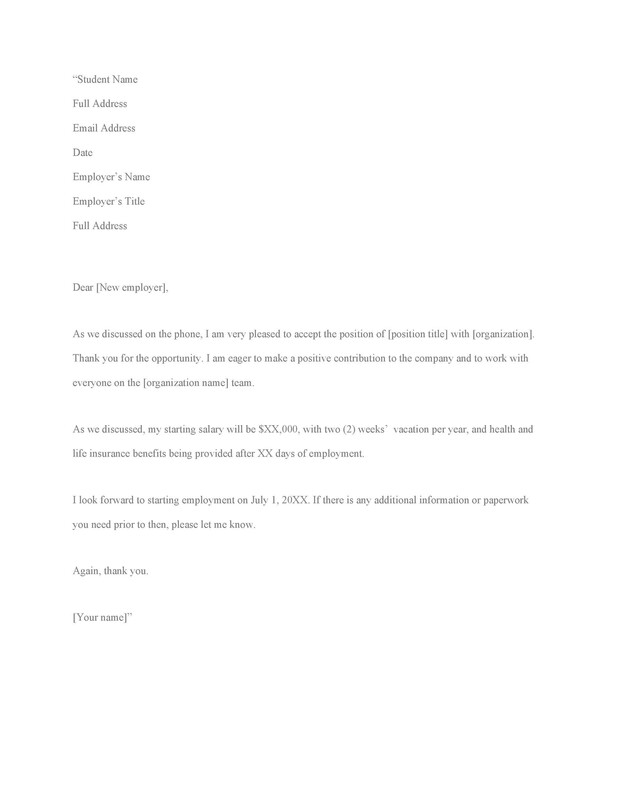 This is not only for the convenience of the employer. It shows you have great etiquette. 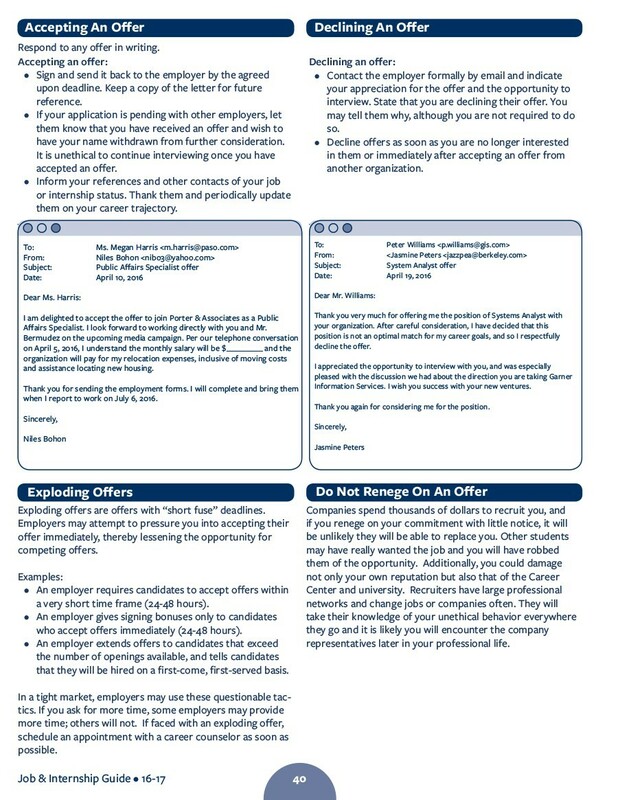 If you are accepting a new job offer, then sending a job acceptance letter or email is important. 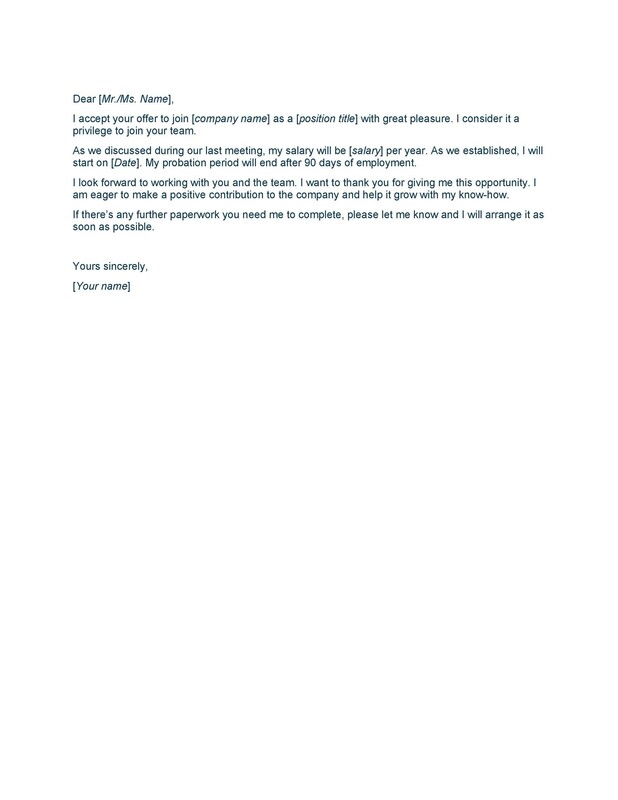 It confirms that you understand the job you are undertaking. It also confirms with the employer that you are on board with everything they have proposed to you. 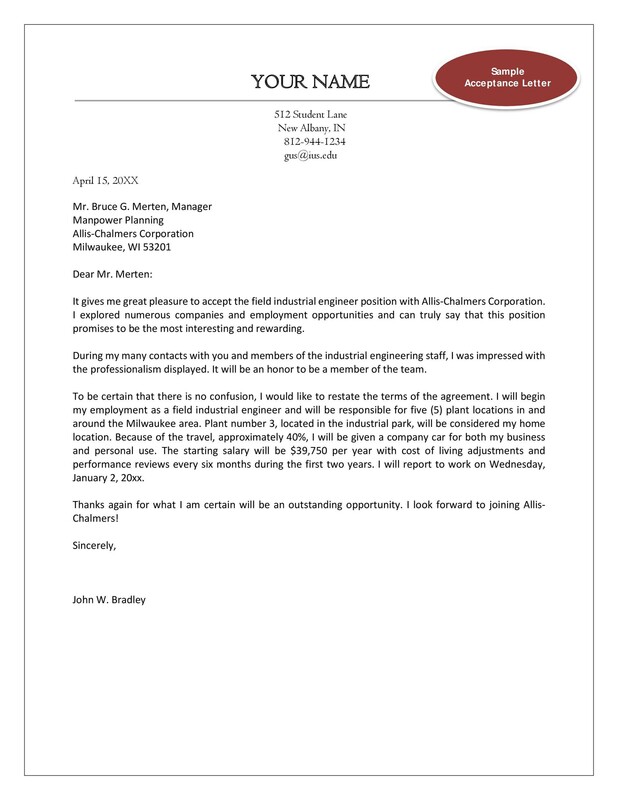 The job acceptance letter takes just a short time to write, but it can leave a lasting impression.